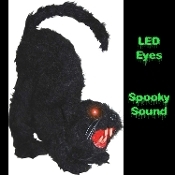 A great little Spooky Black Cat Sound activated prop decoration for your Halloween haunted house or home haunt. LED eyes light up and emits spooky sounds. Fake fur covered Black Cat has lights and sound. Uses 3-AA batteries which are NOT included. 11-inch (27.5cm) long x 9.5-inch (23.75cm) wide x 4-inch (10cm) thick.